The following events happen annually or biennually. If you or your organisation holds an event related to Indigenous language, let us know and we can list it here! The following pages provide information on a mixture of policies, funding and general information around the area of Indigenous languages in Australia. The links below take you to a range of blogs focused on the either Indigenous language projects themselves, or the experiences of speakers, linguists and other people involved in language work around the region. The University Languages Portal Australia (ULPA) provides excellent information on opportunities to study Australian Indigenous languages at a tertiary level: see the summary on their Where can I study an Indigenous Australian language? web page. Most of the courses listed with ULPA have some form of cross-institutional study available. This is a collection of web-based resources which are created around a specific theme or topic. Iltyem-iltyem - an online resource for sign languages used in Indigenous communities in Central Australia. This site contains several hundred video clips of signs for public view. The project was piloted by members of the sign language team from Ti Tree in Central Australia.The website is for people who want to teach and learn Central Australian sign languages. It will also help people learn spoken language, as most of the video clips contain sign language and speech together. Austkin database - this website provides access the austkin database, which contains reference to kinship terminologies and social category systems from published and archival sources for over 607 Australian Aboriginal languages. The website can be used to search and map kinship terms in a variety of ways, and contains a large number of resources relating to kinship in Australian Aboriginal languages. Wadeye Song Database - this database documents the history, language and music of public songs and dances composed and performed at Wadeye (also known as Port Keats) in Australia's Northern Territory. 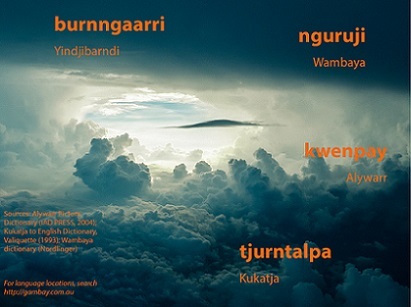 It focuses on three songsets of Murriny Patha people: djanba, wurltjirri and malgarrin. Also included is information on other public songs performed in the Wadeye area, including lirrga and wangga.